Oxydrene's capacity to bind oxygen to blood and tissue maximizes your body's ability to build muscle, reduce fat, and increase energy, stamina and endurance. 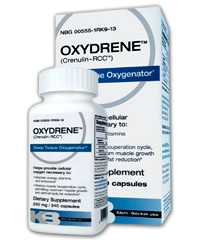 Oxydrene is clinically proven to increase deep-tissue oxygen levels. Oxydrene's capacity to bind oxygen to blood and tissue maximizes your body's ability to build muscle, reduce fat, and increase energy, stamina and endurance. Who is it good for? Anyone who breathes! Body builders will see increased reps during workouts, dieters and fitness enthusiasts will see increased endurance and more rapid fat loss, skiers, climbers and high-altitude vacationers will perform at their peak without altitude adjustment, baby boomers will see increased energy and will regain that youthful bounce in their step, Viagra users and their partners will enjoy increased staying power and sexual fulfillment.